Presented on solid wood plinth. 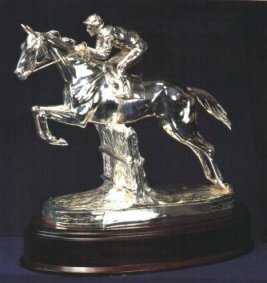 Silver hallmarked filled horse and jockey model. Large Size from top to bottom 265mm. Small 140mm from top to bottom. 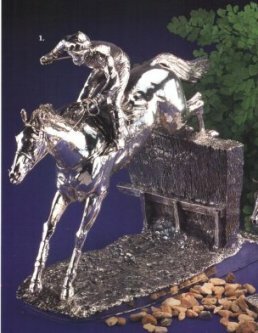 Hallmarked silver filled horse and jockey model capturing the spirit of the winner. Size Large 265mm from top to bottom. 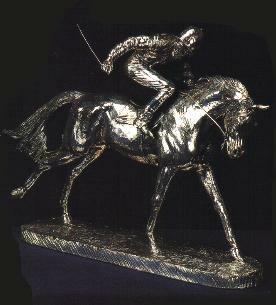 Hallmarked silver filled Horse and Jockey over the sticks small. 1: The Thoroughbred Height 175mm. 2: On Parade Height 265mm. 3: The Favourite Height 210mm. 4: The Profile Height 195mm. 5: Silver Boot riding crop (gents). 6: Silver Jockey Cap riding crop (ladies). Size from top to bottom 320mm. 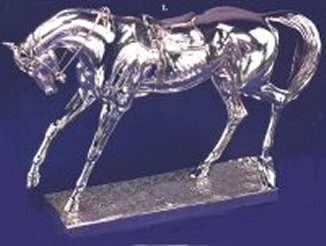 Hallmarked Silver Filled Horse and Jockey on parade. Size from top to bottom 95mm.